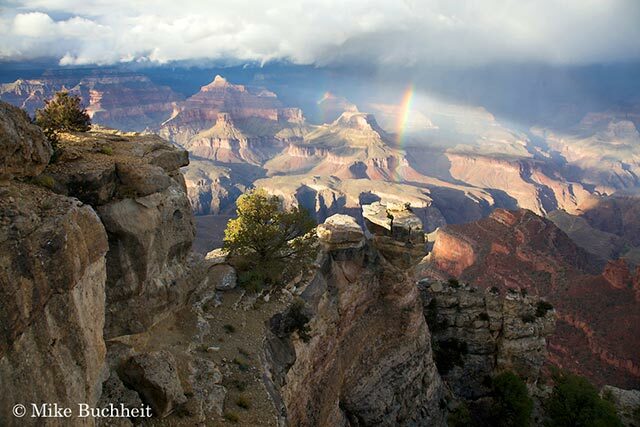 The arrival of the summer rains in the Grand Canyon region is always a cause for celebration. Beyond the palpable relief for plants and animals from the scorching sun, outdoor enthusiasts of all stripes can take full advantage of the welcome cloud cover; from photographers seeking dramatic skies, to backcountry campers, hikers, and backpackers savoring reduced temperatures. The monsoon, as the rainy season in the desert Southwest is known, typically lasts from early July through August. It is the result of a seasonal shift in wind currents which draws moist air northward from the Gulf of California and beyond. When these subtropical high pressure cells collide with the intense heat of Arizona’s deserts and canyons, the result is often powerful afternoon thunderstorms replete with lightning, rainbows, hail, and life-sustaining rainfall on a thirsty landscape. This year’s monsoon began on cue several weeks ago, and has already drenched much of the Grand Canyon State with periodic soakers. For more on the monsoons, follow the link below to view an article written by Gaelyn Olmsted. Frequent visitors to the North Rim may recognize her as the smiling face in a park service uniform at the Visitor Center. Thanks Gaelyn!